First in a two-part series on the make-up and control of jobsite dust. Click here to read Part 2. Dust is inevitable in remodeling. There’s almost no task a remodeler can undertake that doesn’t generate dust, and there are many commonplace tasks—for example, demolition, drywall cutting, and sanding—that produce copious amounts of the stuff. Most remodelers put up makeshift “tents” using poly and painter’s tape in a halfhearted effort to keep dust from spreading throughout the house. 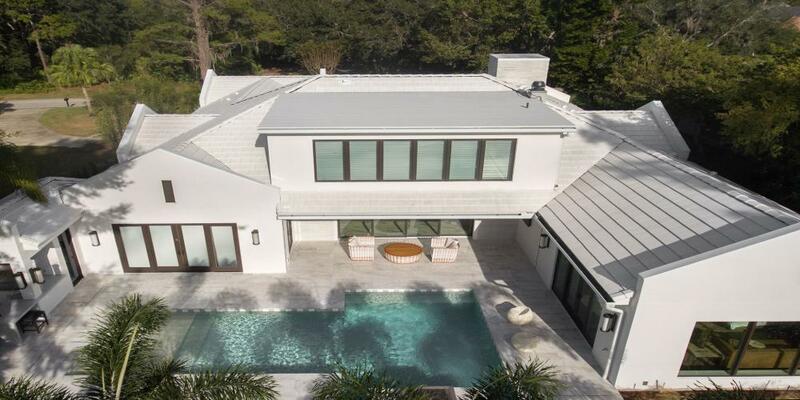 But the attitude of many contractors is that it’s a losing battle; a fact of remodeling life that they and their clients—the majority of whom want to stay in their home during the project—simply have to accept. But for some people, living with dust means living in physical discomfort—and maybe not living as long. The U.S. Environmental Protection Agency’s Lead Renovation, Repair, and Painting (RRP) rule is changing the attitudes and practices of remodelers working on houses built before 1978, but the dust problem goes beyond lead paint. Dust generated on remodeling jobsites is nasty stuff that gets into everything—not just floors, cabinets, closets, and electronics, but into the air inhaled by workers and by homeowners and their families. Failing to do whatever it takes to control construction-generated dust isn’t just bad for business, it’s bad for the health of your employees, your subcontractors, and your clients. Ironically, preventing health problems is a leading motivation for home renovations. 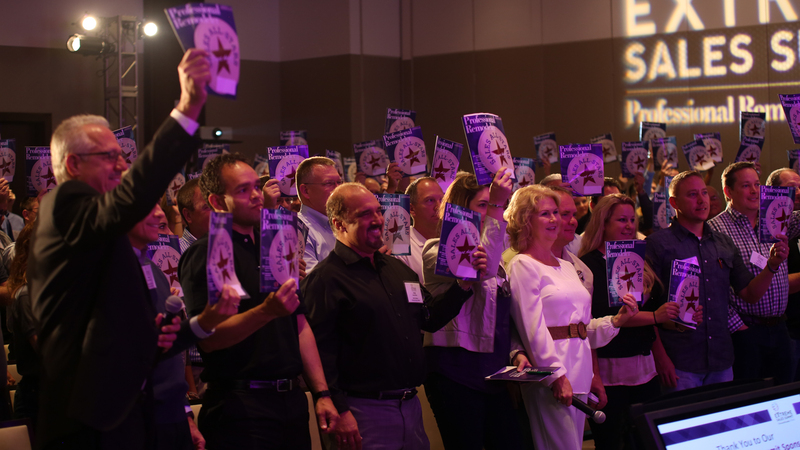 Forty percent of U.S. homeowners surveyed in the Houzz Healthy Homes Trend Study (October 2014) were motivated to remodel precisely because they wanted a healthier home. Moisture, air quality, and cleanliness topped the list of indoor issues that concern homeowners. Most homeowners either want to stay in their home while it’s being remodeled or have no choice in the matter. More and more are equally concerned about air quality during the remodel itself, particularly those who have lived through a past project. Unfortunately, when it comes to construction-related dust, there’s a major disconnect between homeowners’ concerns and the attitudes of remodelers. In market research completed for ITW (Illinois Tool Works) by MMR Research Associates, 89 percent of homeowners surveyed were concerned about “living through the project.” While 64 percent of contractors acknowledged concerns about health issues during construction, only 39 percent reported taking any additional actions to manage the problem. In fact, professional remodeling contractors reported feeling that homeowners are fairly satisfied with current dust management methods. Yet this couldn’t be further from the truth: In research commissioned by ITW in connection with its BuildClean Dust Control System, of 251 homeowner respondents, 81 percent said they were unhappy about dust levels. And an astounding 85 percent stated that jobsite dust is the highest inconvenience of remodeling. For these clients, dust is worse than living with missing walls and plastic over the windows. It’s worse than going without a kitchen sink or dishwasher, or with the refrigerator wedged into the living room. And it ranks above the constant noise of circular saws and heavy equipment. And not just during the job, but afterward as well: Many homeowners told researchers that after the contractor’s work is done, the presence of excessive dust required them to perform additional work themselves to complete the project. Every home has a background dust level, with the specific contents depending on a mix of factors. These include the age of the house, the number of people living in the residence, their activities, and the number and kind of pets they have. Household dust typically consists of some combination of: human skin flakes and animal fur; decomposing insect parts; food debris; lint and fibers from clothes, bedding, and other fabrics; tracked-in soil; soot and ash; particulate matter from smoking and cooking; and allergens and pollutants from the environment. Climate also affects the composition of dust. For example, research done by Lawrence Berkeley National Laboratory established that increased indoor humidity levels are associated with increased indoor dust mite allergen levels. During a typical remodeling project, multiple dust-generating events, such as demolition and drywall sanding, contribute additional components and an increased number of particles to the background dust level. Embedded within remodeling-generated dust is organic matter, such as rodent feces, dead bugs, dust mites, and mold spores; pulverized material remnants, like gypsum from drywall, silica from cement, and sawdust from wood; plus asbestos, lead, and VOCs (volatile organic compounds) from a variety of sources. Most of the dust that homeowners see and complain about has settled on floors, countertops, window sills, bookshelves, trim and molding, and other surfaces. But many dust particles, including some that are too small to see, easily becomes airborne during normal household activity. Whenever people or pets move around, they stir up dust, either tracking contaminants inside from the outdoors, or tracking dust through the house from one space to another. 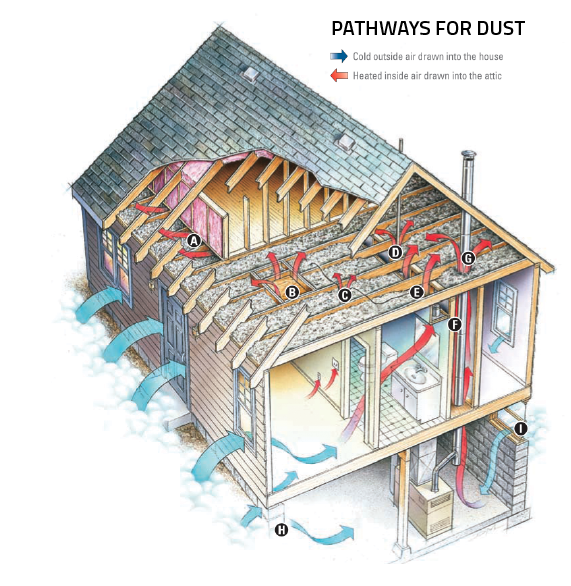 The HVAC system also moves dust around, as do natural pathways in a structure (see “Pathways for Dust,” illustration, above). As warmer air rises and cooler air falls, it carries dust particles with it, not just through rooms and hallways, but into and through unsealed stud, joist, and rafter bays. And every time someone opens a window or a door, the air pressure change can pull in contaminants from outdoors, and stir up tiny airborne dust particles that eventually resettle, only to be stirred up again in an endless cycle. HOW SMALL IS A MICRON? We all know what a coating of dust on a floor or countertop looks like, but there is a lot more going on in that fine, dry powder than meets the eye. Scientists categorize dust by size into three types according to how deep into the body the particles that make up each type can travel. The smaller the particle, the greater the penetration into the body and the greater the health risk (see “The Body's Defenses Against Breathing Dusty Air” article). Inhalable dust consists of particles 100 microns or less in diameter that can enter the mouth and nose during normal breathing. Thoracic dust comprises particles 10 microns or smaller in diameter that pass through the mouth and nose and reach the upper respiratory area. Respirable dust consists of particles less than 5 microns that can reach all the way into the alveoli of the lungs. One measure of air quality is a count of the number of particles larger than 0.5 micrometers or “microns” (μm) in 1 cubic foot of air (see “How Small Is a Micron?” illustration, above). In the course of research done for ITW during development of the BuildClean system, air measurements were taken on active jobsites before, during, and after typical jobsite tasks. ARTI and Dylos airborne particle counters were used, both of which are capable of determining the dust concentrations of particles ranging in size from less than 0.3µm to 5.0µm. 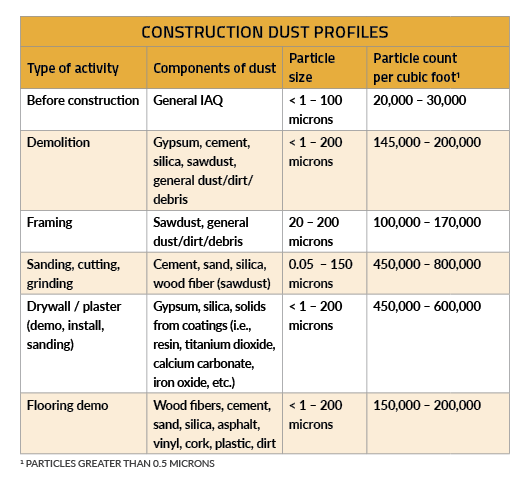 Sample readings are shown in the table “Construction Dust Profiles” (at the end of this article), expressed as the number of particles in 1 cubic foot of air. Particles of 15µm–100µm in diameter (inhalable) can settle within 1 minute; in larger rooms, air volume will extend the time needed for settling. Particles less than 10µm in diameter (thoracic) will take about 3 minutes to settle. Particles at 5µm in diameter (respirable) will settle in about 8 minutes. Particles with a diameter of 1µm (respirable) will take up to 4 or more hours to settle. ITW also measured how fast specific control measures could reduce the particle count on an active remodeling jobsite. The results of its tests show the drastic effect remodeling can have on indoor air quality, as well as the effectiveness of air containment measures (see “Dust Removal Testing” table, below). Similar air testing was recently performed by Bert Schiller, an independent certified industrial hygienist, in a 6,000-cubic-foot space (30x20x10). Results showed that just after the dust-generating event, particles greater than 0.5 microns in diameter reached counts in excess of 500,000 per cubic foot. A BuildClean unit was then turned on in the center of the room, and after 6 minutes, dust concentration dropped to roughly 140,000 particles per cubic foot; after 12 minutes (one complete air exchange), the dust concentration dropped to roughly 90,000; and after 1 hour, the particulate count fell to roughly 30,000. The days of shrugging off the inevitability of dust in a remodeling project are over. In addition to the inconvenience and annoyance it causes homeowners and the increasing awareness of the potential health hazards a dusty jobsite presents, OSHA’s newly revised silica rule makes dust containment and control a necessary part of a remodeling contractor’s standard practices. In next month’s issue, we’ll explore the options for measuring dust levels and will talk with contractors about the materials, equipment, and jobsite practices they use to reduce or eliminate airborne particulates and protect homeowners and workers during construction. Amanda Voss, an author and policy analyst based in Denver, is managing editor of Energy Design Update.